We're Strong to the "Finnish"
This month. we accept KNOM’s Gabriel Religious Station of the Year Award, our 17th top Gabriel. While it’s fun to receive awards, for us, it is a continuing affirmation that KNOM undoubtedly provides more meaningful, heart-touching service than any other radio station in the United States. Part of that reason is our dedicated, hardworking staff, but it is you whom we especially honor for your kindness to the isolated people we serve. Your financial help, your good will, your prayers mean more to us than we can place into words. Thank you. Thank you. Thank you! FLIGHTY CHAT: (left) Live in Studio A, Little Sister of Jesus Alice Sullivan, at left, talks with KNOM’s Laureli Kinneen about the unique bird population in western Alaska. Birding is among Sister Alice’s hobbies. The Little Sisters, originally founded to bring a Catholic presence to Muslim countries, have been stationed in the Nome area since the 1950s. They lead simple, humble lives of prayer, teaching by giving example. WE’RE OFF THE AIR! Well, almost—with very low power we could be heard only within about fifty miles, starting at sunrise a few Sundays ago. Tom Busch managed to catch a seat from Anchorage on an overbooked flight, and with binoculars, he and general manager Ric Schmidt discovered that a cable at the 100-foot level had burned through. Its loss detuned the antenna, rendering it almost unusable. 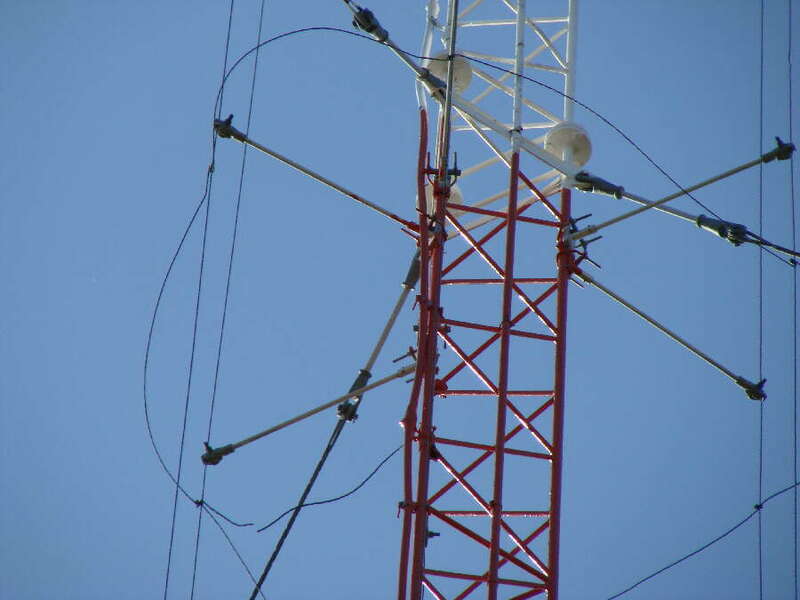 Six weeks earlier, alarm lamps on the transmitter indicated that our antenna had been struck by lightning. Tom speculates the cable is where the bolt hit, vaporizing its copper coating. The steel core continued to pass current, though over weeks, it heated, deteriorated, and eventually snapped. By law, only OSHA-licensed personnel can climb towers. Two are required, and it was Wednesday afternoon before a crew completed repairs and KNOM’s full signal resumed. (Left, above) The KNOM-AM antenna is a "folded unipole." Six cables are parallel to the tower, but connected to it only at the top and at the 100-foot point. 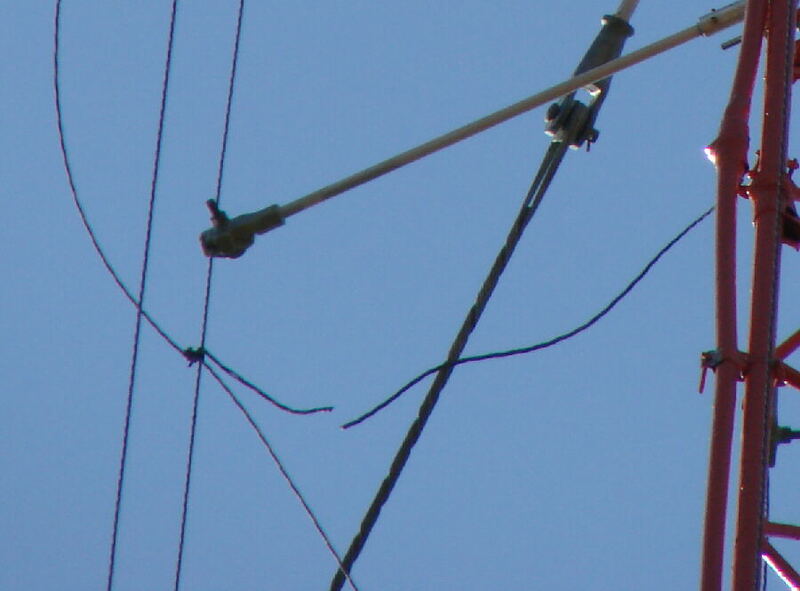 (Left, middle) The cable which broke is the one which connects the cables to the tower at that point. (Left, below) An enlargement of the bottom left of the above image. Over the 80 hours, we received many worried calls from distant villages, and assured listeners that the problem was temporary. The tower firm always deeply discounts their work for us, but ouch! Including next-day air fares, repair of that little cable cost the KNOM mission $4,721.81. INSPIRATIONAL SPOT: Perhaps God made the world round so that we could not see too far down the road. INSPIRATIONAL SPOT: Decisions can take you away from God’s Will, but never out of His reach. 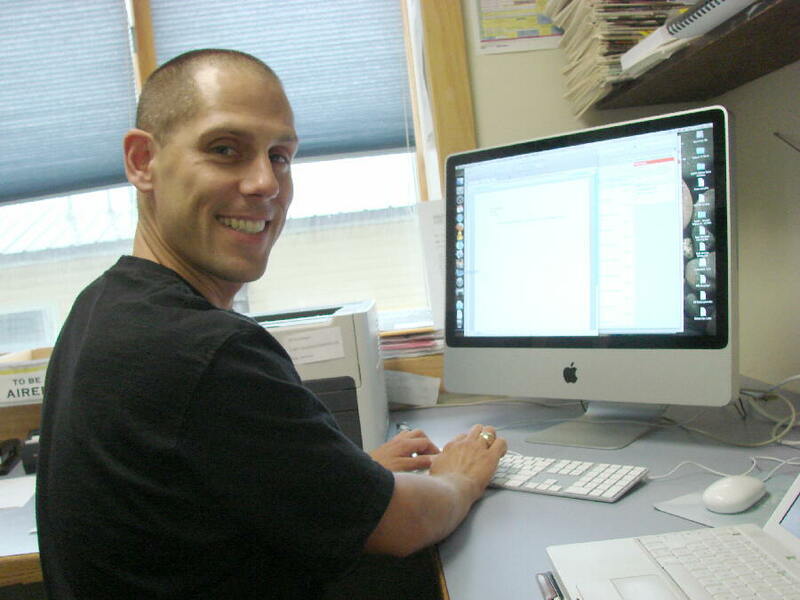 NEWS: If western Alaskans want timely word of what’s happening in the region, they rely on KNOM news director Paul Korchin (left), at work in the newsroom. A KNOM volunteer reporter from 1987 to 1989, Paul returned to lead the news team in 1998. It may come as a surprise that Paul earned a Ph.D. in ancient Middle Eastern languages from Harvard University. His first scholarly book, Markedness in Canaanite and Hebrew Verbs, was published last year. Hard working to a fault, Paul has been a positive mentor to dozens of volunteers. He’s a good friend to all, and a cherished member of the KNOM mission. BRR! KNOM reported that Nome’s first frost of the winter froze the town on the morning of August 24th. It was the first sub-freezing temperature after May 31, though there have been plenty of frigid mornings since. 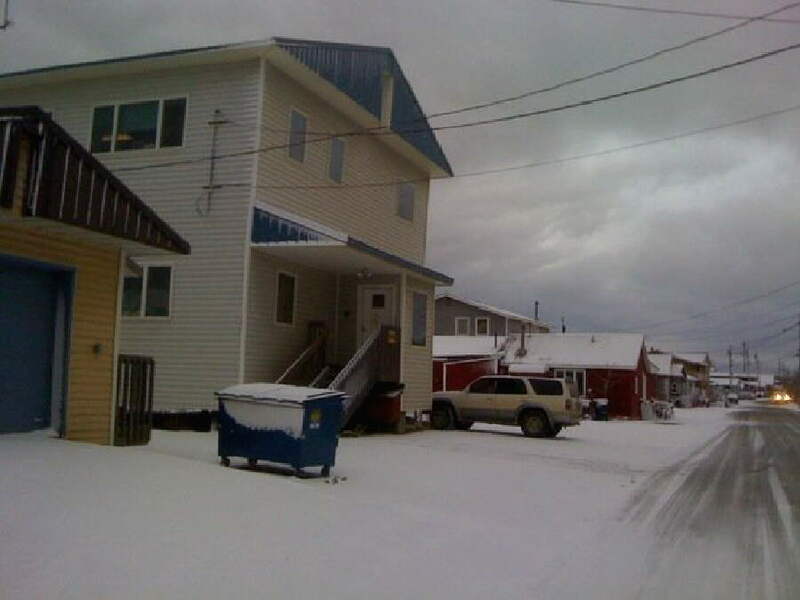 (Left) September 27th brought Nome's first snow of the winter, a little later than usual. PLEASE FEEL WELCOME to use any of our inspirational spots, whether it’s a magnet on your refrigerator, or a church bulletin, or a prayer group. If you do reprint them, please give the KNOM radio mission credit. That will help spread the news of our work. WHY SPOTS? From the first concept of a Catholic radio station to bring spiritual guidance and educational help to western Alaska, it was clear that radio would be extremely effective , but only if it were listened to by almost everyone. That meant providing a service that was entertaining. So, from the very beginning, the KNOM mission’s format called for a variety of popular music, plus a large volume of interesting, regional news, inserting short educational and inspirational ideas, like ads on a commercial station. The concept was instantly popular, and remains so today. 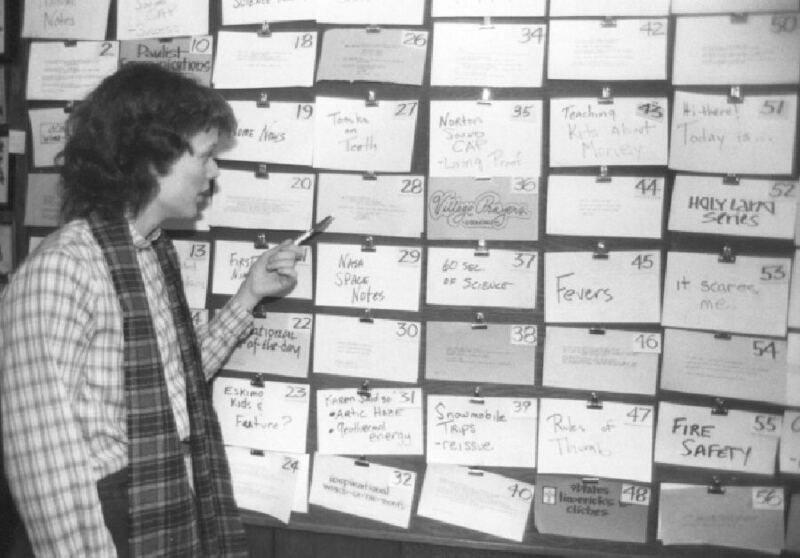 (Left) In 1983, Jesuit volunteer Lynette Berger keeps track of spots on the air with cards on an 8-foot board. The board indicates spots that are currently on the air. Even-numbered cards represent inspirational spots, odd-numbered cards represent educational ones. Today, we organize spots by computer. If Lynette looks familiar to you, it may be because today, she is Lynette Berger Schmidt, KNOM business manager and wife of general manager Ric Schmidt. Every year, we broadcast approximately 34,000 educational spots and 34,000 inspirational ones. Since 1971, we’ve repeatedly been told that one of our spots happened to touch a listener when the listener needed it most. We know of a couple of times when a spot has prevented a suicide. Thank you for making this valuable, lasting, continuing service possible! INSPIRATIONAL SPOT: We go through life collecting bricks and steel bars of sin, hurt and doubt. The world tells us we’re free to collect these bricks, as long as we’re not hurting anyone. But the reality is that these bricks and bars add up. They build a prison cell for our soul. They turn us away from God. We can see beauty and freedom beyond those walls—with the surrender to the Peace of Christ. Here, KNOM volunteer Danielle Sylvester stands by KNOM’s back entrance on a chilly, blustery summer day. Danielle signed up for a second year, and is also continuing her education. 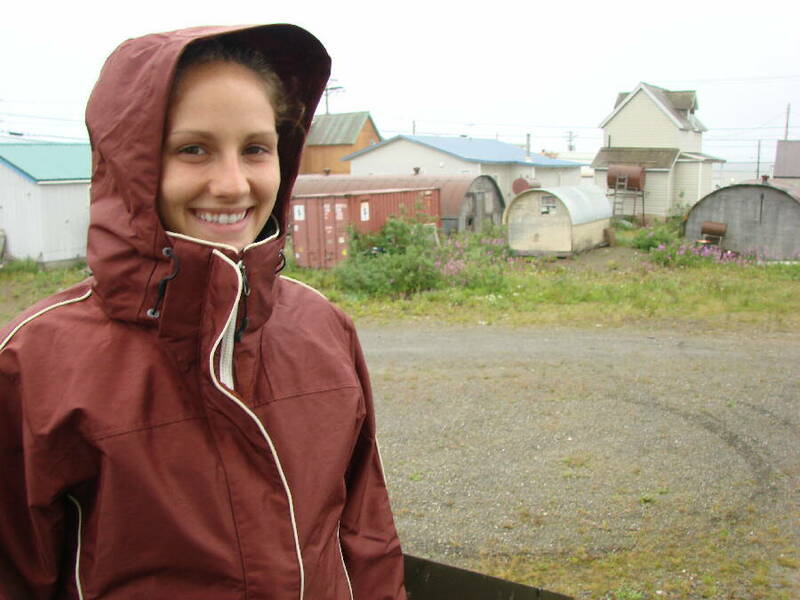 During her first volunteer year, she became an Emergency Medical Technician I, and takes shifts with the Nome Volunteer Ambulance Department. This autumn, she’ll be training to be an EMT II. It must be contagious. New KNOM volunteer Leah Radde has signed up for courses to become a volunteer EMT I. And yes, those are World War II Quonset huts in the background. Nome is so remote, and shipping costs are so expensive, that very little is discarded. FOR A TEN-YEAR-OLD GIRL, her fondest desire was to be wished a happy birthday over KNOM. We complied, with seven friends and relatives doing just that. OUR RENEWED PLEDGE TO YOU: We respect you. We promise, as we have since 1966, that we will never provide your name and address to anyone, for any reason. Please consider adding the KNOM radio mission to your will. You will create a legacy that will endure for many years. We prayerfully place all bequests into funds that provide for major improvements, as well as protect the mission from future emergencies. INSPIRATIONAL SPOT: There’s a list on my refrigerator of things I need to do. “Pray” and “love God” are missing from that list. It’s not because they’ve been done and crossed off. Lord, please help me to place You at the top of my list and make prayer so natural that the reminder is not needed—because it is written on my heart. FOR WANT OF A SHOE…. 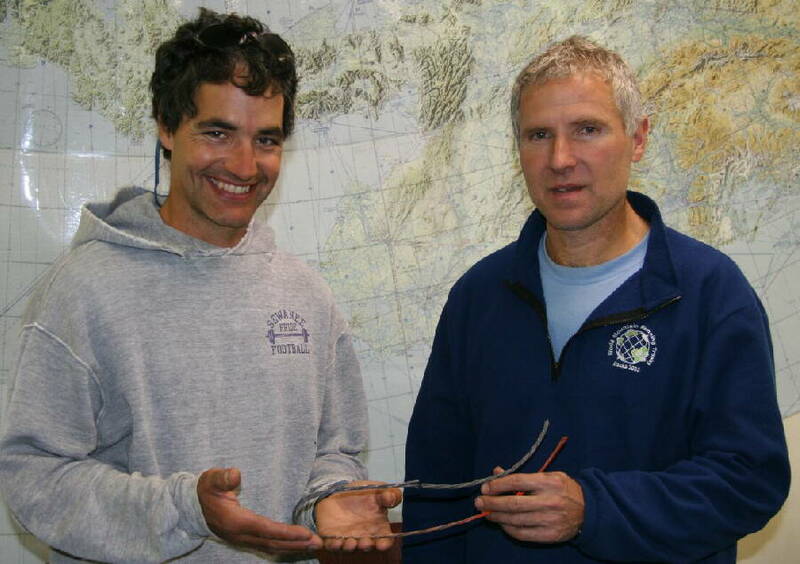 (left) From left, tower climbers Pat Irwin and Barney Griffith hold the cable that lightning damaged on the KNOM tower a hundred feet above ground. FORTY YEARS AGO: It’s been on hold since March. 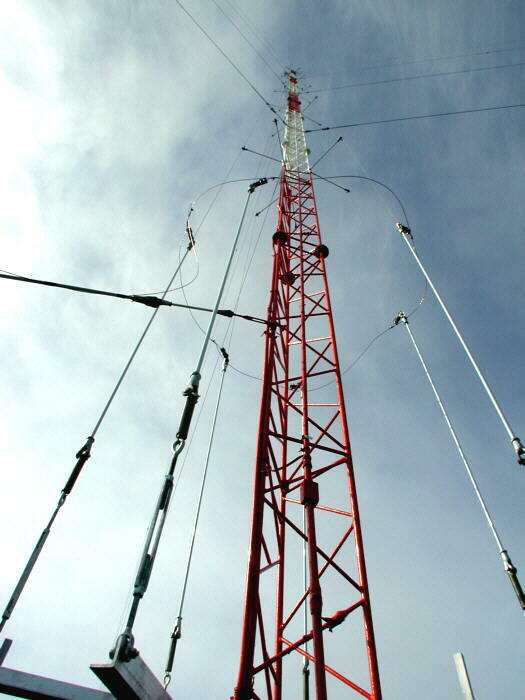 October 28, 1969, the Federal Communications Commission posts an announcement that the Catholic Nome radio application is “considered ready and available for processing.” Approval for construction is granted eight months later. TWENTY YEARS AGO: October 27, 1989, KNOM provides a detailed report to Bishop Michael Kaniecki, SJ. Staff estimate that 8,000 western Alaska adults listen to KNOM every day. The average audience at any one time is 2,300. It’s clear that the aging, poorly insulated buildings (left) desperately need replacement. RECENT NEWS TOPICS on KNOM included glacial melting, relocating flooding villages, H1N1 flu in Alaska, child support services, faulty monitoring of salmon runs, homeless shelters, wind power, domestic violence, and many more, thanks to you. WE’RE STRONG TO THE “FINNISH:” From Lapland in Finland came a clear KNOM reception report by an university professor who teaches English and enjoys radio listening as a hobby. His college town, Joensuu, is about sixty miles from the border with Russia. TO YOU, our gratitude is deep and sincere. As Nome is over 500 miles from the nearest highway, it’s easy to feel isolated and remote, especially now, as we’re already into the long arctic winter. We pray for you, for your intentions, and for those you love every day. May God be with you, and grant you strength, hope and joy in great abundance.